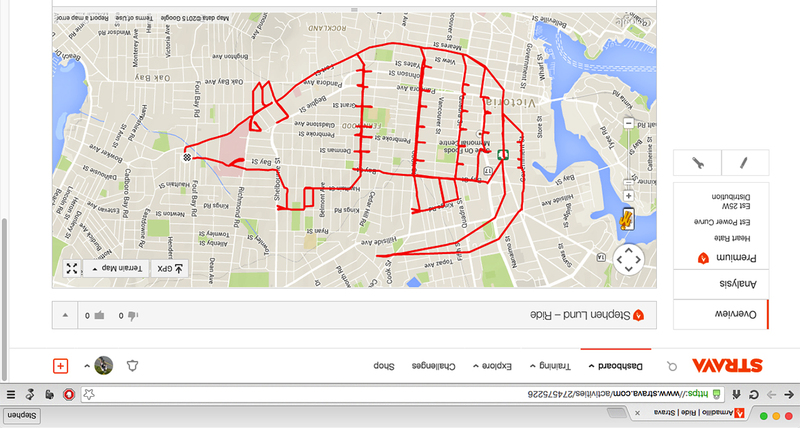 It was an off-day for Victoria’s Strava artist and a sad day for his daughter, whose high hopes for a Strava armadillo went woefully unfulfilled. As every artist knows, there’s often a gap between vision and output – between what you conceive and what you actually create. Sometimes, that gap is chasmic. I studied a few armadillo images, and then on my map of Victoria I sketched out what seemed to me to be a pretty fair likeness of a “little armoured one” (which, I learned, is the translation of armadillo from Spanish to English). That, unfortunately, is the only thing I was able to translate with any degree of accuracy. After 26 kilometres of Strava-sketching, I could only laugh (and thank the universe it didn’t happen on a mermaid-scaled project) when I saw the outcome. Instead of an armadillo, I’d drawn a pudgy, pouty-faced sewer rat in a frilly flapper-style dress. Man I’m telling you, it’s a lapazoo! This entry was posted in gps art and tagged armadillo, artistic vision, bicycling, creativity, cycling, garmin, gps, gps art, strava, strava art, victoria bc. Bookmark the permalink.